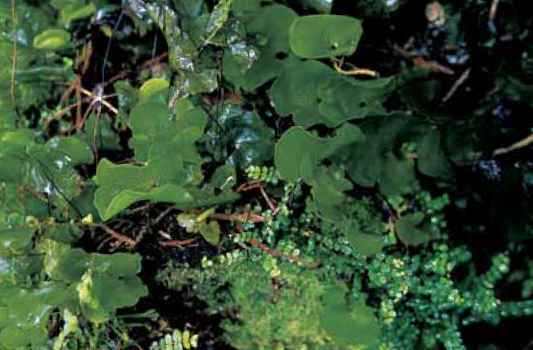 Glassy green foliage of Trichomanes reniforme glows along the woodland trails of New Zealand. an 18-in. 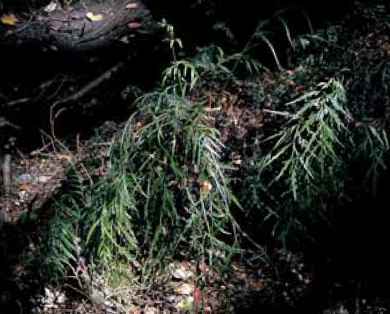 (45-cm) creeping, deciduous species from Korea that is the counterpart in habit and spread to T. noveboracensis in the United States. The darker green T. beddomei has 30 or more pairs of pinnae compared to 20 to 24 for T. noveboracensis. Use it as a ground cover that intermingles with ease in wet woodland conditions in Zones 7 to 9 and probably 6. Thelypteris ovata (egg-shaped) is a tall deciduous species up to 4 ft. (1.2 m) that produces ovate fronds from creeping rhizomes. The apex narrows abruptly. The species is native to Mexico and the U.S. Southeast. Var. lindheimeri, from Texas, has a smattering of tan scales along the undersides of the mid-veins, whereas the eastern variety, var. ovata, usually lacks scales.